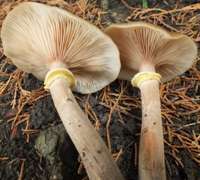 There are many forms of Honey Fungus, and in some books they are all given the scientific name Armillaria mellea even though it is now accepted that there are several distinct Armillaria species within the group formerly called Honey Fungus. This parasitic fungus can do immense damage to forests; it attacks both coniferous and broad-leaf trees. By the time the fruitbodies are in evidence, the damage internally is usually so great that the tree is doomed. Gardeners dread this invasive parasite, which can attack a wide range of plants and is certainly not restricted to trees. Honey Fungus mushrooms are bioluminescent (the gills glow in the dark), although their ghostly greenish light emissions are usually far too weak to be visible to the human eye in a normal woodland environment, even on a moonless night. To see this effect it is necessary to sit close to some of the mushrooms in total darkness (in a windowless room) until your eyes have become accustomed to the dark and your pupils are fully dilated. Perhaps the best known glowing mushroom is Omphalotus illudens, commonly known as Jack O' Lantern. Very common and widespread throughout Britain and Ireland, Armillaria mellea is also found throughout mainland Europe, although it is a rare or only occasional find in Scandinavia but increasingly common further south. This species is also found in many other parts of the world including North America. The mycelial threads by means of which Armillaria fungi spread throughout a tree and, more significantly, from one tree to another, and black bootlace-like rhizomorphs (meaning literally 'root forms') - pictured above - made up of parallel bunches of fungal hyphae. 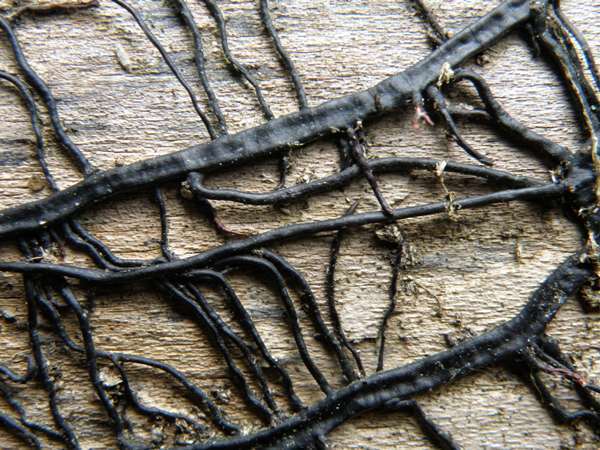 The black rhizomorphs shown here developed beneath the bark of a hardwood tree, and eventually the bark fell away to reveal the mycelial threads. With Armillaria mellea, the individual rhizomorphs are typically 2mm across, but sometimes they bunch up and form more substantial threads up to 5cm in diameter. This species was first described in 1790 by the Danish mycologist Martin Vahl (1749 - 1804), who named it Agaricus mellea. (Most gilled fungi were initially placed in a giant Agaricus genus, now redistributed to many other genera.) 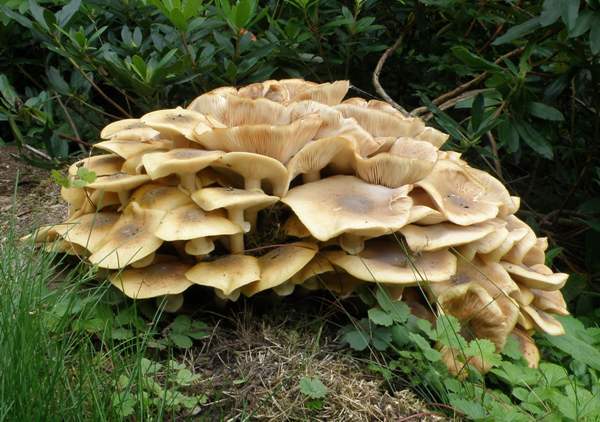 Honey Fungus was moved into its present genus in 1871 by the famous German mycologist Paul Kummer, whereupon its scientific name became Armillaria mellea. Armillaria mellea is the type species of the genus Armillaria. Synonyms of Armillaria mellea include Agaricus sulphureus Weinm., Agaricus melleus Vahl, Armillaria mellea var. sulphurea (Weinm.) P. Karst., Armillariella mellea (Vahl) P. Karst., Armillaria mellea var. maxima Barla, Armillaria mellea var. minor Barla, and Clitocybe mellea (Vahl) Ricken. The specific epithet mellea means 'of honey' and is a reference to the appearance of caps of this species rather than to their flavour, which is anything but sweet. In the USA this species is often referred to as the Honey Mushroom. Although all Armillaria species were for many years generally considered edible when thoroughly cooked, members of the honey fungus group (including Armillaria mellea, the type species of this genus) that occur on hardwoods are considered by some to be suspect, as cases of poisoning have been linked to eating these fungi; this is most probably due to a small but significant proportion of people being adversely affected rather than a universal human reaction to these fungi. We therefore recommend that this species is not collected for the pot. Honey Fungus Armillaria mellea appears to be particularly fond of tree roots, often producing vast swarms of overlapping fruitbodies - as the picture above, taken in Cambridgeshire, England, shows. 5 to 15cm in diameter; colour ranging from honey-yellow to red-brown, with a darker area near the centre. The cap flesh is white and firm. Initially deeply convex, the caps flatten and often develop wavy, striate margins. 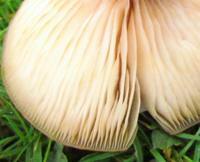 Fine scales cover the young caps, most noticeably towards the centre. These scales do not always remain evident as the caps reach maturity. The adnate or more often weakly decurrent gills are crowded and flesh coloured, gradually becoming yellowish and finally developing rusty spots at maturity. When young, the stems are white, turning yellow or yellowish-brown and finely woolly as the fruitbody matures. 5 to 15mm in diameter and 6 to 15cm tall with a finely woolly surface. The stem flesh is white, full and fairly firm. 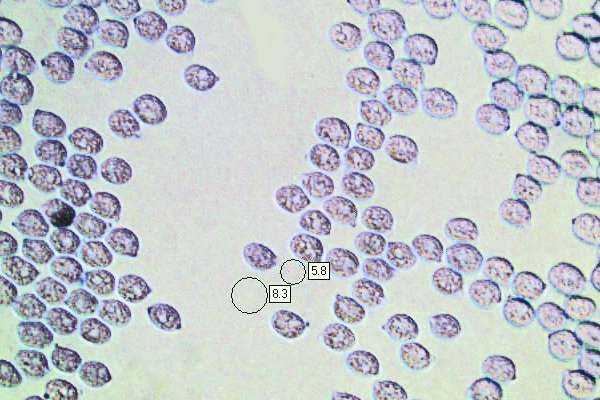 A pale yellowish stem ring usually persists to maturity. 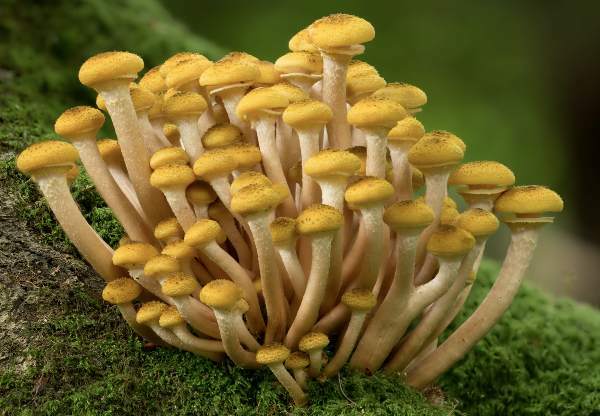 This helps to distinguish Armillaria mellea from other Armillaria species such as Armillaria ostoyae, Dark Honey Fungus, which has a white stem ring with dark brown or black scales on its underside. 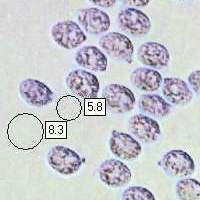 Ellipsoidal, smooth, with an apiculus; 7-9 x 5-6μm; hyaline, with drops; inamyloid. Parasitic on or up against broad-leaf trees, including fruit trees in orchards; also occurring as a saprobe on stumps and dead roots, and occasionally on fallen branches. 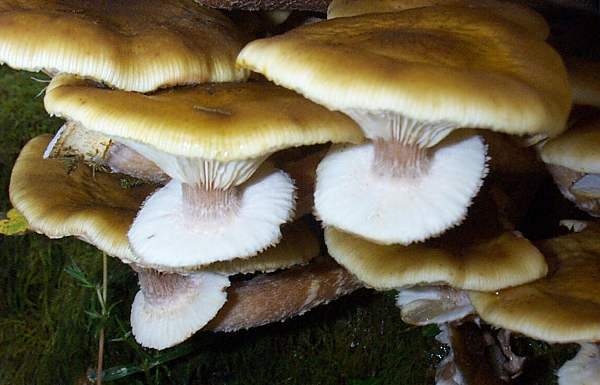 Some experts sub-divide the Honey Fungus into several species; others lump them together. 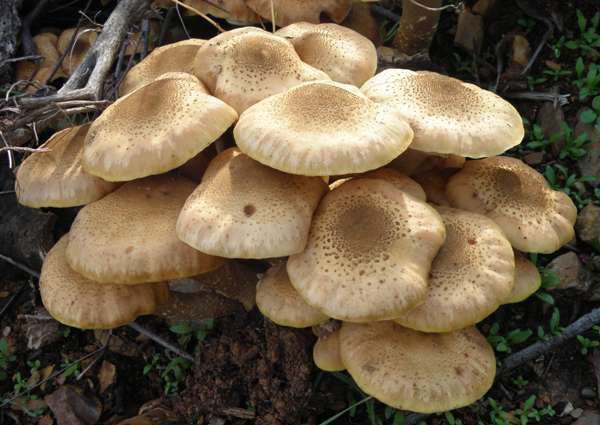 For example, some varieties of Honey Fungus Armillaria mellea have very scaly caps and small stem rings; others are almost devoid of scales but have large white rings. Other Armillaria species are similar in general appearance but can nevertheless be separated in the field if you study all of their macroscopic features. Armillaria ostoyae, commonly referred to as Dark Honey Fungus, has distinctive dark brown or black scales on the underside of its persistent stem ring. Armillaria tabescens, sometimes referred to as the Ringless Honey Fungus, is very similar but has no stem ring and its gills turn pinkish-brown at maturity. Armillaria gallica has a bulbous stem and a fleeting cobweb-like ring that becomes merely a yellowish ring zone at maturity. Pholiota squarrosa is generally similar in colour and covered in scales; it retains an inrolled margin, its gills turn uniformly rusty-brown, and it has a radish-like smell and taste. Pegler DN. (2000). 'Taxonomy, nomenclature and description of Armillaria'. In Fox RTV. 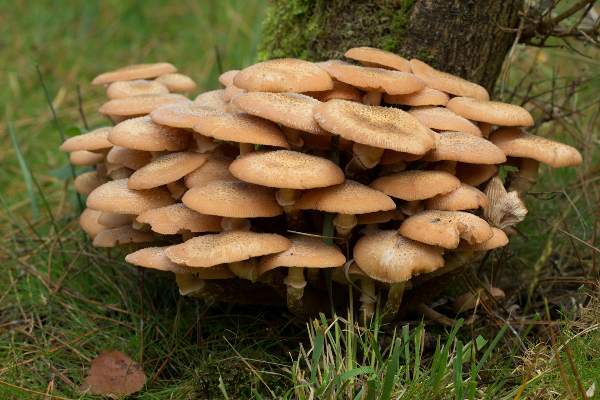 Armillaria Root Rot: Biology and Control of Honey Fungus. Intercept Ltd. pp. 81–93. ISBN 1-898298-64-5. 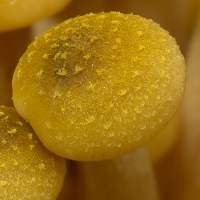 Taxonomic history and synonym information on these pages is drawn from many sources but in particular from the British Mycological Society's GB Checklist of Fungi and Kew's Checklist of the British & Irish Basidiomycota.